SMALL BUSINESS TIP #10: Email Marketing Tips | S©ribaceous, Inc.
You’ve got a stunning new website and branded social media accounts…now what? Now it’s time to tackle email marketing! 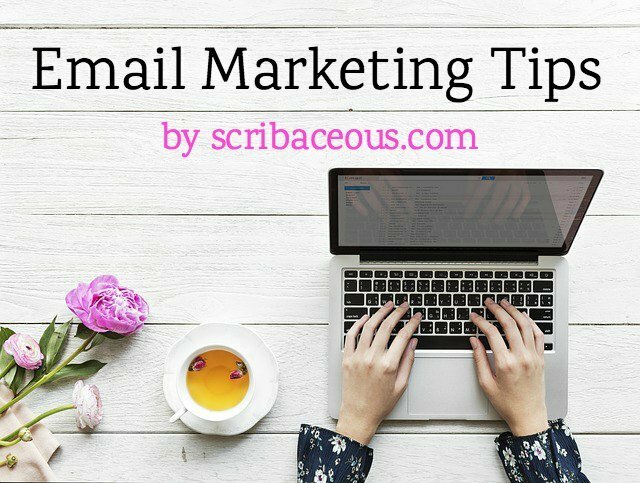 Most of my clients are solo entrepreneurs with overfilled plates, so in my tenth small business tip, I’m going to stick to the basics of email marketing and share some simple email marketing tips. solicit sales of goods/services, donations, etc. advertise a sale, event, etc. build loyalty and trust, nurture the business relationship, etc. add value to existing customers by educating, assisting, etc. In the broadest, and what many of us would consider the most obnoxious, sense, emails are sent unsolicited to a large list of purchased leads as part of an aggressive marketing campaign. It’s more typical that marketing emails are sent to an existing database of clients/customers or “warm” leads that have been generated by the entity itself. I’ll only be covering the latter form of email marketing in this post. The vehicle that enables a business entity to send the emails in an efficient and trackable manner is an email marketing service. As you might imagine, there are many of varying quality. The top three factors to consider when choosing an email marketing service are 1) cost, 2) ease of use, and 3) their ability to keep your emails out of spam. Some email service providers offer a free level of service and allow you to grow into a paid plan. Others charge from the get go, usually charging a minimum monthly (or discounted annual) fee that increases based on the number of subscribers. Some charge only when you blast an email, basing their charge on how many subscribers on your list. Don’t just go with the cheapest. Look down the road as far as you can and choose the one that is most cost efficient once your business is stabilized. It’s best not to have to make a switch once you have a larger list. All email marketing services require you to go through a bit of a learning curve, but some make it easier than others to start a list, create and design an ongoing email campaign or send out an one-time blast. All of our inboxes are inundated, thus email providers are keen to keep your inbox as free from spam or junk mail as possible to keep you happy. They use algorithms to achieve this purpose. Some email marketing services are better than others at coding their emails in such a way to stay out of the dreaded junk folder. Again, you want to do your best to choose the email marketing service that will serve you best in the long-term. While it’s possible to make a switch, it’s always better to avoid this if you can. Mail Chimp—A friendly, fun and relatively simple email marketing service that serves small to medium lists well. It’s free in the beginning with paid subscriptions available as you grow. Aweber—A little less user friendly, it’s good choice and more cost effective if you expect to grow your list substantially. Auto responder email(s)—a single or series of emails that is automatically sent in a specific order to subscribers from the moment they sign up for your email list. It can be a simple welcome or several emails designed to add value, educate, motivate, inspire, etc., to your subscribers. One-time announcement—an individual email, often referred to as a “blast,” that is sent to your email list to announce a product, service, event, etc. Newsletters—typically sent weekly or monthly to add value, announce, educate, motivate, inspire, etc. All of these emails should include links to bring visitors to your website in order to boost your SEO. Every email should come from the real YOU. Think first person, not third. Write in a conversational and friendly tone. Speak like you’d like to be spoken to. Keep the design simple. The more images and features you use, the more likely you’ll trigger the email provider’s spam filter landing you in your subscriber’s junk folder. Don’t inundate people with emails. People will pay more attention when your “blasts” contain truly important info. ADD VALUE. Give your subscribers a reward for reading your email. Have a catchy subject line to induce curiosity. More on subject lines HERE. Keep your email as short and simple as possible. The bitter truth is that most people scan emails these days. Always link back to your website! Invite your subscribers to REPLY to you. Using bold and red really works. Have realistic expectations about the impact of your emails and don’t take the sometimes snarky requests to unsubscribe personally. People often forget to be human when they’re responding to an email. We can offer you more than just these email marketing tips! We’re available for consultation, training and/or setup—or to do your email marketing for you. All you have to do is email us! By the way, Gmail is NOT your only option for your small business’ cloud-based email. Here’s a helpful article on some other legit options—Best Cloud Based Email Services for Business!